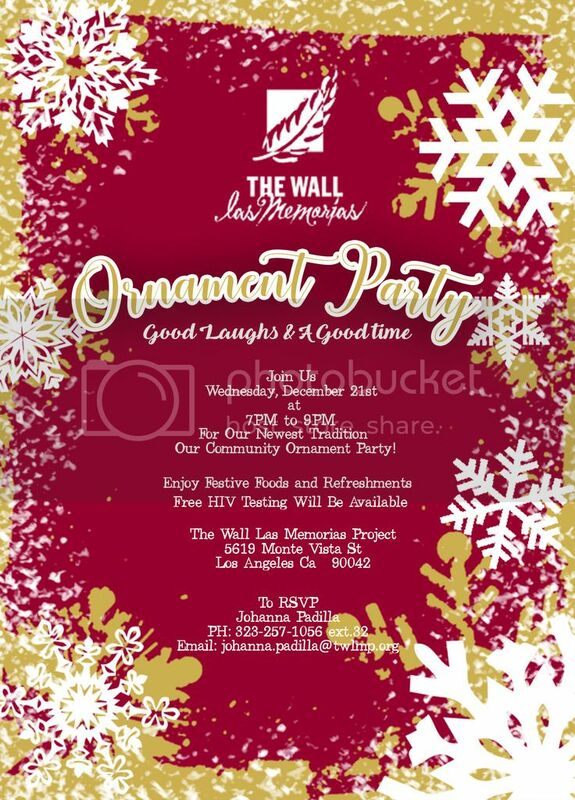 The Wall Las Memorias Project invites you & all of our friends to our 2nd Annual Ornament Party on Wednesday, December 21st from 7-9 pm at our Highland Park office. Come by for an evening of holiday fun & meet our friendly staff, enjoy holiday music & treats, & bring an ornament to decorate our community tree! Festive light food & refreshments will be served but if you want to bring a tasty treat to share, feel free to bring some too! FREE HIV testing will also be made available. PARKING: Event parking is available throughout the neighborhood on Monte Vista St, as well as Avenues 57 & 56. To go green, take Metro Gold Line to the Highland Park Station (we're just 2 blocks northeast from the station).